First off, I'm happy to note that The Parkway will reopen! It was a fantastic place to see a flick in Oakland, based in a converted 1950s church, giving the upper screen fabulous tall concrete arches along the sides of the auditorium. Seating was composed of an assortment of loveseats and sofas at the front (though you'd want to get there early to snag those! ), and the usual style of stadium seating further back, except every third seat was replaced by a small table. This meant that the pizza, or other food, you'd ordered would have somewhere to sit as well - and good pizza, too! The beer selection was worthwhile, as well, in pints or pitchers. It may well have to move from its wonderful original location, as negotiations are proving to be desperately drawn out, though it's highly likely to be somewhere in the same neck of the woods, be it downtown, Lake Merritt, Rockridge, or somewhere else nearby. In any event, if you love film and a cinema with an emphasis on genuinely have a good time rather than a hope of passable projection, I'd encourage you to have a look in on what's going on! I'd seen the trailer, but thought I'd missed out on its theatrical run; not so! I hadn't realised quite how well it wound up doing at the box office. In any event, I found it a refreshing break from the usual standard of CG animation, where every character has to be more or less cute, and almost always of rubbery smoothness. (Not that that's a bad thing per se, of course =:) Highly recommended. This is Sylvain Chomet's latest animated work, after The Triplets of Belleville. I admit, I found it more difficult to truly get into the film than Bellevillle. Initially, we're not quite sure whether the title character is genuinely good at what he does, or merely a hack, outpaced by the arrival of the 1960s. However, as the movie progresses, that falls away to leave us with the humanity - the people presenting all these variety acts. I probably shouldn't say too much more, but yes, this is one to go out of your way for, if you don't mind a genuinely "slice of life" film - one without any particular start or ending, and barely any heroes. It's quite wonderful. The latest release from the director of Moon, an intelligent, low-budget (probably due to nobody charging full rates, given it certainly looks as slick as any major Hollywood production) sci-fi flick you ought to see if you haven't already. As you've likely seen from the trailer, it centers on a project capable of letting one person re-experience the final few minutes of a situation - in this case, the minutes leading up to an explosion on a commuter train heading into Chicago. There are two endings in this film. =:) First, we see the mystery introduced at the start of the film be solved - but then, we're lead down a more inquisitive path. Perhaps there's a fair degree of suspension of disbelief required, but it was mostly a thoroughly satisfying production, other than relatively minor plot points, and some carpet-chewing by the project's director. Briefly, as you probably know, it's based on a PKD short story. Hollywood's had no shame in turning out some schlock based on his works, but some notable works as well, including Blade Runner, whose title they bought from another author. It's essentially a sci-fi romance, and frankly, it works beautifully well. The film brings a religious element to it - but in a similar way as did Time Bandits. Astoundingly (to me, at least), today's seen my Flickr view count nudge four digits, just for today. ^_^; I have to say, I was very sorely missing being able to post such views into wild rabbit life. I've so greatly enjoyed being able to share such glimpses back in 2010, so to be able to resume - as these buns are relatively local - such does mean quite a bit to me, as well as aiding my progression (well, I'd like to hope) as a photographer. And it is, undeniably, simply calming - look out upon a meadow with bunnies, and I defy you not to feel, quite fundamentally, happy. I'll be writing about hints on entering the DSLR arena sometime, but in the meantime, B&H have written a helpful guide to point-and-shoot cameras, which also covers some basic photographic concepts like aperture. Good little posting. Oh, and I absolutely cannot end without noting a nine-page tribute to The Brigadier. If you've followed Doctor Who for any length of time, this really is something you oughtn't miss - as beautiful a coda as he could've wished for. Being an ex-professional stage actor, who can't do stage work any more because of bad health, The Illusionist hit some still raw nerves and got quite emotional for me. Eep! I'd never known. Would you be prepared to say more by email, or even here? Sylvain Chomet is one of the best animation directors in the world, for my money. In Triplets, as I suppose here also, he brought us effortlessly into the world of someone so dedicated to their craft that we couldn't help but be entranced. Such depth of feeling is something Hollywood regards as way out of bounds; not Japan, of course, but the UK's tiny animation industry appears to remain dominated by Hollywood rather than the European mainland. Perhaps it'll eventually show its real nature again, as it does occasionally, as with Watership Down. 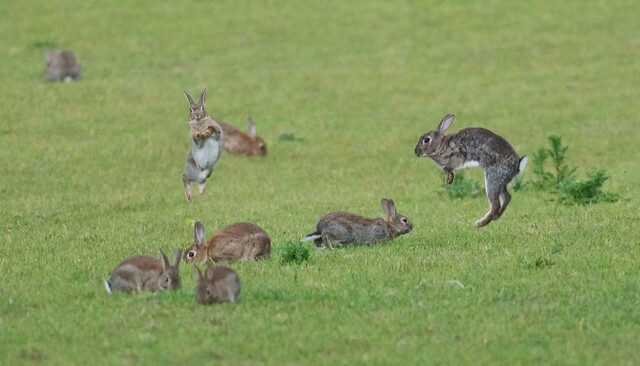 look out upon a meadow with bunnies, and I defy you not to feel, quite fundamentally, happy. It's so very true, ne? ^_^ I was so lucky in finding these buns - I'd originally headed off in the other direction, west, then south, under the main road, up north a bit, then east, and did indeed spot a bun or two along the way, but not with that semblance of relaxation, more of a transitory nature. And then I popped across the road, and saw horses.. often a good sign, given that mean a tended pasture, less prone to those predatory sorts, and rabbits do seem to get along perfectly well with horses, modulo the small matter of size & weight difference. Thanks! I've been astounded how popular that photo's been, along with the previous one - Sunday saw the total views almost nudge into four digits! Amazing. ^_^ And so many favorites, too! Is it just money that keeps you from diving into a DSLR? You have the passion, unquestionably, and once more, the buns - always a sign of healthy lands, I say. I was surprised by how much I enjoyed Rango, probably because it did work so hard to just be true to the source material it was riffing on. When the bunny is ready, bunniness will appear. It seems right up your alley. And then I went and forgot the other thing: Have you encountered 'Kaninhop' as well? Even if it doesn't actually for-real exist I love it for the word 'Kaninhop'. Thank you, thank you, thank you. You know which link I'm thanking you for. It really was beautifully done, ne? A nod to the many aspects of the Doctor too, but so perfectly spot on for the Brigadier - you could just hear him speaking. Blank black space with a thin white border with approx 4x3 aspect ratio.